March 20, 2018: One of our biggest missions in OPSGROUP is to share risk information and keep operators aware of the current threat picture. 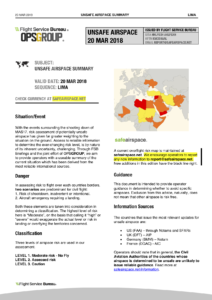 The latest Unsafe Airspace Summary is now published, and available to members here as a PDF download (Unsafe Airspace Summary 20MAR2018, edition LIMA). The main changes since the last summary are below. For a current risk map, refer to the Airspace Risk map in your member Dashboard. The situation in Afghanistan remains similar. On March 13, Germany added wording to maintain FL330 or higher, still recommending against landings at Afghan airports. Germany also issued updated NOTAMs for Mali, Iraq, and South Sudan. All warnings remain as previous, unchanged from the prior NOTAMs.